12 pp. Roman, 169 pp. The third part of Henri Mercier’s work Vocabulaires et textes berbères des Aït Izdeg (René Céré), Rabat 1937, pp. 451 to 512, comprises forty original texts written in Aït Izdeg, a Berber language spoken in the Middle Atlas range of Central Morocco. These rare texts are presented as facsimile reproductions in this edition. For the first time they have been translated to French by Claude Béringuié (Banyuls-sur-Mer, France). The volume editor has numbered both the original texts and their translations consecutively, so that you may follow both of them page by page. 1. L’habitation 2. La maison 3. Intérieur de la maison 4. Le foyer 5. Le four 6. Le moulin 7. Le pilon 8. Les tamis 9. La baratte 10. Ustensiles du ménage 11. Le cheval 12. Le mulet 13. L’âne 14. Les vêtements 15. Les bijoux 16. Le tatouage 17. Les fards 18. La grossesse 19. L’accouchement 20. La naissance 21. La première coupe de cheveux 22. L’enfance 23. La circoncision 24. L’enfance (suite) 25. Le mariage 26. La demande 27. Premier cadeau de fiançailles 28. La noce 29. Les maladies 30. La mort 31. La tombe 32. Les funérailles 33. Les labours 34. Le sarclage 35. Les moissons 36. Le battage 37. La tonte des moutons 38. Le lavage de la laine 39. Le cardage et le filage 40. Montage du métier et tissage. Collecting oral productions has occurred invariably in Berber studies since the 19th century. More recently, scholars have developed a new interest in the documentary collections and studies of the colonial period. A first reason for this trend is that these texts were often difficult to access, therefore, the new editions facilitate availability for researchers and the general public as well. Another explanation for the renewed interest in the documentation of the colonial period is related to the present reflection on the historical construction of identity through endogenous sources. [...] The Berber Studies series is known among specialists as a platform for Berber linguistic studies and for offering the revised edition and translation of text anthologies that were not – or no longer – available because the original manuscript remained unpublished or were published in outdated transcription, and were often not translated. Most of these volumes concern the Tashelhiyt language spoken in South Morocco (vol. 2, 4, 5, 9, 19, and 23) while individual volumes address texts from Algeria (vol. 3), Mali (vol. 13), Libya (vol. 17), Figuig (vol. 34), and the Middle Atlas (vol. 18) in Morocco. Therefore, this second volume (vol. 39) regarding ethnographical texts from the Middle Atlas is a welcome addition to the linguistic variety of the series. 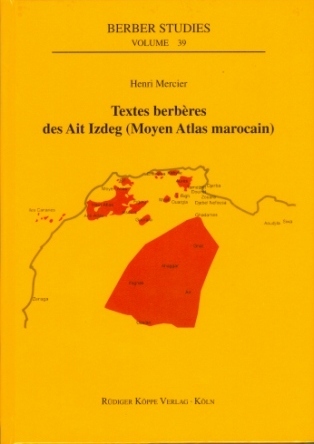 [...] In conclusion, translating archival ethnographical records from the Middle Atlas, Textes berbères des Ait Itzdeg provides a significant service to the discipline and to everyone interested in the cultural history of this area.